I decided the other day that I want to include more lifestyle posts on this blog, as a way to make it more personal and also so I can look back at these posts in the future. I thought to kick things off that I would introduce you to the most important little guy in my life, my yorkshire terrior, Pippin! 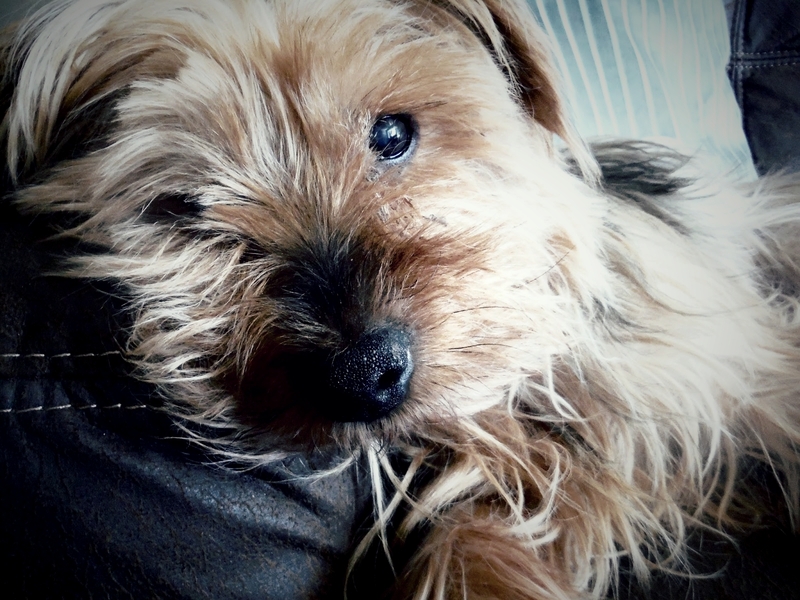 This little pooch has just turned 14 years old so I thought it would be nice to share with you guys 14 facts about him. 1 | We got this little man when I was 7 years old. I came back from a weekend in Wales to find a little black ball of fluff running around my back garden! 2 | When he was a puppy he could fit in one hand and absolutely loved to be picked up and cuddled. 3 | He also used to try and get as far into an empty crisp packet as he possibly could, which was very entertaining to watch. 4 | He hates other dogs. It's not the best situation when we're out walking and wants to attack every dog he see's. It's the complete opposite with humans though, he will let anyway kiss and cuddle him. 5 | He likes to play with his toys by putting them on his bed, grabbing it with his teeth and shaking the bed until the toys flies off and he can chase after it and do it all over again. He also tries to balance his toys on his back, which is hilarious to watch! 6 | He will eat anything. Food wrappers, dirt, hair, plastic... you name it. 7 | When his hair grows long it only goes curly on his back legs and bum, and it's the most adorable thing in the world. 8 | Every night before bed he gives me one kiss on my nose. 9 | We got the name Pippin from the dog on an old tv show called Come Outside where this woman and her dog would fly around in a polka dot aeroplane and teach kids about the places they visited. 10 | There have been numerous occasions where we've had to drag his bed to the back door with him still sleeping in it, pick him up and put him outside to get him to go for a wee before bed, he's that lazy. 11 | The minute you start to stroke him, he will lift his paw and refuse to put it down until you stroke his belly instead. 12 | Even though he loved being picked up as a puppy, he hates it now and it's a very lucky day if we manage to pick him up without him throwing a hissy fit. Nobody outside of my immediate family can pick him up, which disappoints many people! 13 | He claims everything he possibly can. If another dog comes to stay for the weekend, he will sleep in their bed and play with their toys! 14 | It sounds strange, but he can instantly tell if I'm upset. He comes and lies next to me and attempts to give me as many kisses as he can until I get him to stop. Dogs really are mans best friend and I honestly don't know what life would be like without Pippin. There are so many other things that make this little guy who he is but if I listed them all we'd be here all day. I love him more than I can say and wouldn't swap him for anything. I try my hardest to keep him happy and I only hope I'm doing a good enough job for him! Awh Pippin is so cute! It's adorable that he gives you a kiss every night! What a cutie my family dog died about 3 weeks ago and we got her when I was 11, they really become part of the family! My dog loved roast dinner aha! Soo cute! Love it so much! Pippin sure is a cutie, we love dogs, there's nothing like the unconditional love and support they give us! He's very lucky to have you in his life!